New Bed and Breakfast Websites - InsideOut Solutions, Inc.
We launched two new sites last week that are as different as they could be. 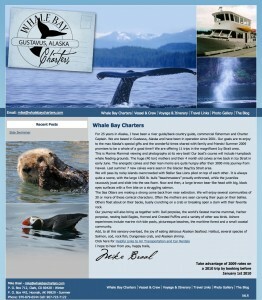 Whale Bay Charters has a new WordPress site for their Alaskan Boat Charters, and the Blair House Inn, an extensive B&B in Texas Hill Country, also has a large new HTML-based site. The Blair House Inn is a unique property, and it was an exciting challenge to incorporate their interesting business model into an attractive & functional site. They have one of the most popular cooking schools in the nation. The food network came to Wimberley to film a segment on their unique “BBQ Camp”. They have a a popular series of classes that includes themed regional cooking, like Italian or French. We wanted to build a site which would allow viewers to easily move through the products and services offered at the Blair House. The Hill Country Inn also has an art gallery on-site, where local and national artists’ work is displayed. 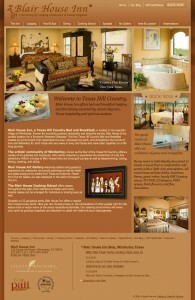 We used beautiful pictures of the inn and the work there to convey the anomalous feeling at the inn: laid-back Texas style, gourmet dining, art & education! We also included a blog to assist in search engine optimization for the site. By allowing the staff and innkeepers to make new content on the site on a regular basis, the site remains a vital and changing place, that reflects the activity that is happening at the inn. Speaking of blogs, we launched a WordPress-based site for Whale Bay Charters, a one-man boat charter business that sets sail from Gustavus Alaska for about a dozen private charter trips every summer. They are geared towards families and marine mammal viewing. But not just any little seal, Captain Mike Braal brings his vessel the Exodus through the Icy Strait to the feeding grounds of humpback whales. When Mike came to us, he felt that no one had ever found his Alaska Boat Charters via his web site online. He had a limited budget, but we were able to make a site that could change and shift almost as much as the ocean he sailed. Through the power of WordPress, we made a low-cost, high-efficiency site that would allow Mike to update and change the information on his regular pages as the seasons change, as well as include a photo blog area where he and his guests can share their wildlife photography from the week-long trips. As always, both of these sites were built with great Search Engine Optimization in mind, and according to the office manager over at Blair House Inn, they are seeing an increase in traffic and bookings already.